In the U.S., 55% of the population aged 50 and older suffer from low bone density or have been diagnosed with Osteoporosis according to the International Osteoporosis Foundation. Having a low bone density increases your chances of breaking a bone and depending on the break could rapidly decrease quality of life. So how can we stop this epidemic? A properly executed resistance training program. Our bones are made up of tiny cells that are constantly breaking down and rebuilding to maintain our bone density, but around age 50 men and especially women begin hormonal changes that make it more challenging for our bone cells to rebuild. According to scientific research, proper strength training can prevent bone density loss and even improve bone density when performed correctly. 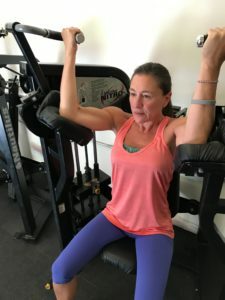 The trainers at Titanium Performance train each specific muscle or muscle group by moving in a safe and controlled manner through a full range of motion. This training style reduces the external force on the joints making it safe for someone already suffering from osteoporosis or individuals looking to prevent it. By progressively overloading each muscle during training followed by proper recovery, the muscles will become stronger and increase pull on the bones they are attached to. The increased pulling on bones forces the bone cells to break down and build back stronger to accommodate the stronger muscles. Increased muscle mass and bone density will improve balance and decrease the chances of a fall or breaking a bone if a fall does occur. If you or someone you know is suffering from osteoporosis or low bone density and would like more information on how Titanium Performance can improve their quality of life please email us! Great job with the information and article Morgan. I love the knowledge you and Tyler have on how the body works and changes. Makes me feel safe training with you guys.